Your home is your castle. It's a sanctuary from the hassles of the outside world where the only person you have to satisfy is yourself. Choosing the type of home is a vital decision that sets the base for creating your relaxing refuge. Are you trying to decide between an apartment and a house? Here are some valuable lifestyle and economic reasons why apartment living is a wise choice. A couple of them may even surprise you! If a faucet starts leaking or the hot water goes out, a homeowner must either call professional help or attempt a DIY repair. Apartments have the benefit of a fully-staffed maintenance team to handle any emergencies. In addition, your weekends can be spent on fun activities rather than mowing the lawn or painting the kitchen. With an apartment, your main financial obligations are rent and utilities. Mortgages consume more of your money on a monthly basis, especially when steep property taxes are factored in. Houses also require more maintenance as well as electricity, water and gas than apartments, making those bills higher as well. Amenities like BBQ grills, pools and gyms are expensive add-ons for house owners. The only alternative is spending time and money traveling to off-site facilities. Springs Apartments is proud to feature many of the most desirable amenities such as resort-style pools, 24-hour fitness centers and car wash areas. Meeting people can be difficult in a residential neighborhood, where each home is an island. When you live in an apartment, you frequently encounter your neighbors while using the amenities or even attending on-site events, making it easier to strike up friendships. 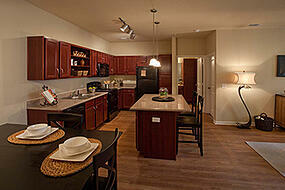 The community clubhouses of Springs Apartments are also natural locations for casual gatherings. Upscale neighborhood locations are factored into the price of a home, driving it out of most people's budgets. Maintaining multiple homes allows apartments to better absorb the cost, making even the most prestigious neighborhoods more affordable. When you rent a Springs Apartments home, you receive the priceless benefit of an entire team with a single goal of providing you with a first-class living experience. Contact us to learn more about why Springs Apartments are the best place to call home.